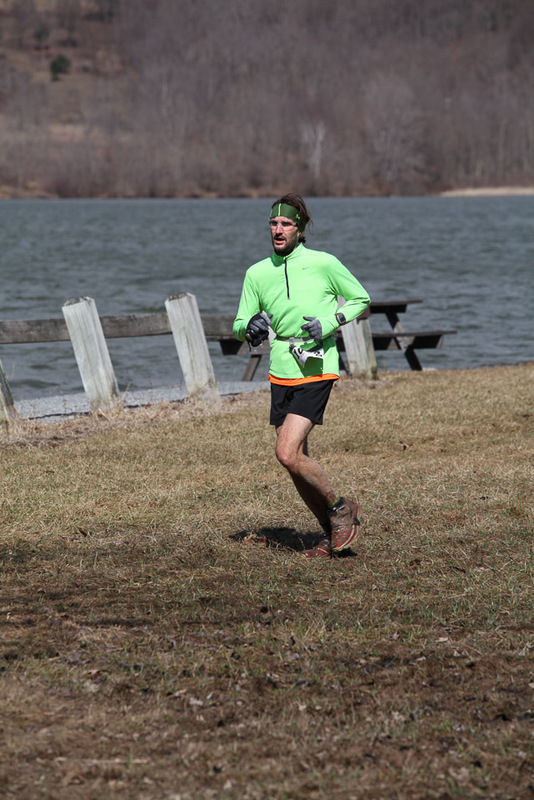 On April, 4, just one week before Forget the PR 50K, I ran the Dirty Kiln half-marathon. This race is organized by the Allegheny Trail Runners and is either a 5-miles or a half marathon. As last year, I did the half-marathon. The race is a basic 5 miles loop plus an additional 8 miles. Each loop as two stream crossing and of course, a lot of mud. Some hills are very challenging as well so that it might be better to walk them. The 2014 edition was epic in the sense that the weather was really windy and cold. The 2015 edition was way better: not so much wind, some sun but still a lot of mud (and so, fun)! This was then supposed to be a great run. The race is organized by the Allegheny Trail Runners group, a non-profit that supports local charities. So, instead of going for big events that are rather big money makers for a company or an individual, this race is organized by trail lovers to benefits people in need. Very sweet. Last year, I booked a crappy motel in the Altoona area to stay before the night. The bed was terrible, did not sleep so well and I had pain in the back. I decided that this year, I will take a better place and chose the Hampton Inn that includes a breakfast. That was a good idea, especially because they provide basic runner food for breakfast (peanut butter and bagel anyone? ), which was perfect: no need to pack anything, the breakfast is availability when you wake up so you do not have to worry about that aspect. There is no race expo or packet pick up before race day. The race starts at 0900 so you have plenty of time to get there and get it. The packet contains a tech t-shirt, your bib and chip. No fancy stuff inside but for $35, this is already more than enough! If you do this race, be there at least 10 to 15 minutes before the race starts to make sure you get your packet and put your chip on. The race is a 5-ish loop plus an additional 8-ish loop. You run mostly on single-track trails with very muddy spots. There are also stream crossing. The first loop is not very challenging or difficult without any high elevation. So, this is a great warmup. The second loop is more challenging with a good elevation and a lot of steep hills. So steep that you will have to walk them and not run them. If you run it and plan to finish in less than 2:30, it is wise to start in the beginning of the pack. Many people will not let you pass them when being on a single track trail because they just do not listen to you. I was stuck in the beginning by two persons that discuss and never heard me when trying to indicate that I wanted to pass them. So, just try to rush the start to avoid that. The race is marked with flags so it is difficult to lose yourself. Also, as you do (more or less) the same loop twice, this is easy to remember where you passed before and you can easily recognize parts of the race. Be careful to keep track of the flags, otherwise, you can get lost on the trails. The race offers also a great view when doing the second loop and being on top of the hills. Being there on a sunny Saturday morning offers a wonderful scenery. While the view is great, it seems that some folks enjoy the view but not the silence. A dude was stupid enough to bring a portable speaker in hit bagpack (or whatever he brought on the trails) put his music on while climbing on the trails. Earphones are forbidden for safety reasons, but heck, when you cannot bring headphone, what is better than annoying everybody with a bigger sound system? Let’s just bring the phone with a portable speaker (or just use the phone speaker, who knows). Seriously, what is the f*ck!ng reason you would like to take your radio on a race? Who takes a speaker when going on a trail race and experience the nature? And why putting your music on a speaker to bother everybody around you? 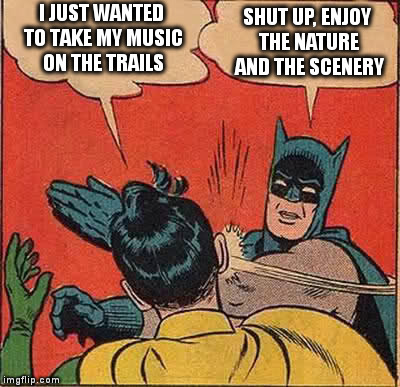 (private message: dude, if you read this message, stay home with your speaker and enjoy your music alone and just enjoy the nature when going on the trails). If possible, I would just suggest to the race director to forbid any listening device: if you go on the trails, this is not to reproduce your gym environment with a lot of electronic equipments. Otherwise, just stay at the gym and watch Discovery channel when exercising: the benefits will be similar. This is just unfortunate to have a dude like this on such a great event. In terms of support, there are volunteers on the course to guide you and help you to cross the streams. There is an aid station on the course with water/gatorade and gels. You can also take water after the first loop. So, in total, you get 3 potential stops to get water or gels. The volunteers are very (very) friendly and helpful and make sure you stay safe on the course (especially at the stream crossing). Again, all the race is very well organized and accommodates beginners or experienced runners. Once you are done, you get a wood medal and a bottle of water. There is also pizza and snacks provided to all runners. Unfortunately, no beer as in Rock’n The Knobb (the other race organized by the same non profit) that might be a better idea, especially if you are driving right after. The state parks typically offers showers if you want to be clean before going back home. The race pictures are taken by volunteers and available … for free. Yep, nobody that tries to take your monthly income for 3 pictures of you! Sweet, isn’t? Heck yeah, as long as you are able to avoid the obnoxious dude that carries his speaker when you explore the nature, this is definitively one of the best race in Pennsylvania and I do not see any red flag that will tell you not to do it! First of all, this is pretty cheap ($35), fun. There is a lot of mud, which can be challenging. Then, there is pretty steep hills that will also change from your usual workout. The support is very good and volunteers are very friendly as well. Also, the race pictures are available for free! And finally, all the profits goes for a charity. So, there are definitively no reason for not going there! Thanks again to the Allegheny Trailrunners group for organizing this race. So, far, Dirty Kiln and Rock’n The Knobb are among the best races I have done. Pretty cheap, very friendly and supporting charities, this is a fantastic non-profit and I hope you’ll get a chance to experience one (or several) of their races! See you at Rock’n the Knob 2015 then! I have heard nothing but great things about this race and I plan on doing it next year. 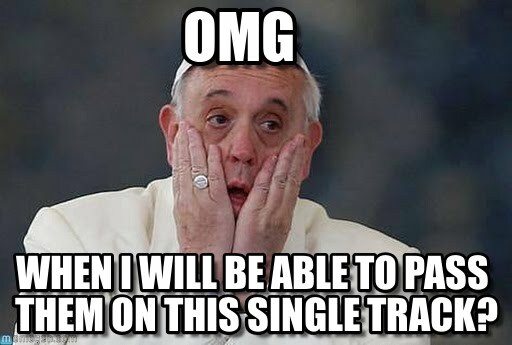 Hey jerk, I can listen to my music if I want. I thought your post was cool till I started to read you criticizing others. If you want people to read your posts keep the swearing and the mean comments to yourself. Btw it’s an iPhone. An amazing new piece of modern technology with a speaker. Welcome to the modern age. Dude, next time sign up for though mudder and not dirty kiln, this might be a better match! That music was killing me. I know there was a no headphone rule, so I can’t say to put on headphones, but it seems just as unsafe to run with loud music where you can’t hear what’s going on around you. Please try to respect other runner’s safety and choice to enjoy the quiet of the trails. A lot of us run to get away from technology.